Two recipes in one day?? How lucky are you guys?! 🙂 This is one of my favorite dishes to make/eat and this is always a winner whenever I have guests over. I think that it’s a versatile dish that most people will enjoy and it’s relatively easy to prepare. The word “piccata” refers to a way of preparing your choice of meat (veal, chicken, etc) or fish with lemon, butter, capers, white wine, and spices. Vegans can make this recipe too with seitan! Here in the United States a piccata dish is typically served with rice or pasta, but in Italy it’s served as a “secondo” or second course (after the pasta or starch) without any accompaniments. I prefer to make this dish with rice because the rice absorbs the lemon/butter sauce so well and I just really love rice–so happy I can eat it again! For those of you who have recently started following my blog I was on a low-carb thing for a while to lose weight for my spring break cruise. I’m still always watching what I eat, but I’m not being as strict as I was before. Thank God! One can only go so long without rice and pasta! Prepare your rice how you prefer. Heat up oil very hot. Season chicken with salt/pepper. Dredge chicken in flour and shake off the excess flour. Place in the pan and DON’T TOUCH THEM! They’ll form a nice crust and lift off the pan when they’re ready. Flip. When they’re done, place on a plate with papertowels to absorb any excess oil. Set aside. Deglaze the pan with the white wine. Make sure to scrape the bottom of the pan with a metal spatula to get all the crispy bits, this is where the flavor is! 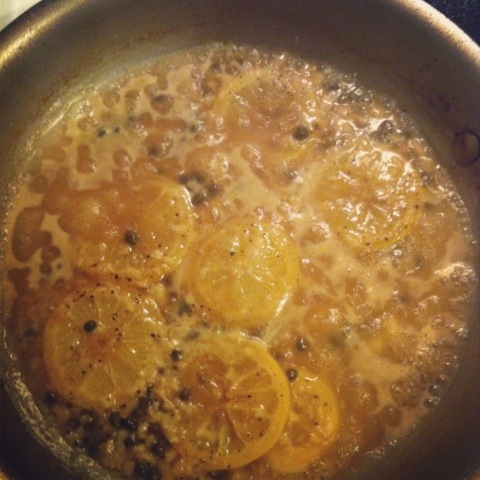 Add the chicken stock, capers, and garlic and let it simmer and cook down. Slice one of the lemons and add 4-5 lemon slices to the pan. Once it’s cooked down significantly, add your butter and swish around to combine all ingredients. Add some salt/pepper to your taste and place the chicken back into the pan and coat the chicken with the sauce. Squeeze fresh lemon juice over the chicken and throw in some chopped parsley and serve over the rice. I m makIng this tonight. And I m making the spaghetti with anchoves. Melissa, I love your recipes ;). Being a “chef” myself, I am always looking for new recipes to try. Your recipes are always appealing to me! Thanks 🙂 hope you continue to read and try some recipes! 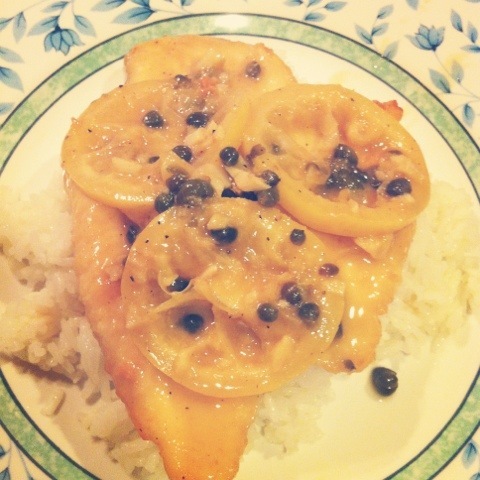 Your chicken piccata looks great. I like rice with dishes like this…as you said they soak up all the wonderful sauce.